I can't say enough how much I enjoy Eric's work. Eric's a great guy and a personal friend. It's good to see him succeed in this business for it's hard graft and not all about rainbows and unicorns. Hi Conor, thanks for posting those pictures. The Spotlights were started to not only hi-light a builders work, but also to try to get to know them a little better (as well as one can on-line) through the Q&A as well as responses to member questions. A lot goes on behind the scenes that culminates in the builders end product. So often we just see the eye candy and may not appreciate all that goes into getting it to that stage. The hope, in the end, is to build appreciation for the process and the individuals who drive it as well as the end product. It's hard work that takes talent and management skills, and even then there are no guarantees that success will come. As you said: "it's hard graft and not all about rainbows and unicorns." That said, I would agree the Eric seems to be hitting it. I really like the look of your bi-laminate work. It really seems to enhance a sense of flow in your work. Other than aesthetics, is there any structural advantage to joining tubes that way? First off, thanks for the interest and for hosting the Spotlight. I look forward to the conversation! The bilam does a couple of things. Functionally, it beefs up the head tube and the seat tubes, allowing me to run the same unbutted tubes I would with a lugged bike, but with the geometrical freedom of a fillet bike. This allows me the use of any tube combo in any desired angle for fine tuning the ride and design of the bike. There is no denying the aesthetic options. It gives me a lot of creative real estate to match the look to the "personality" of the bike. 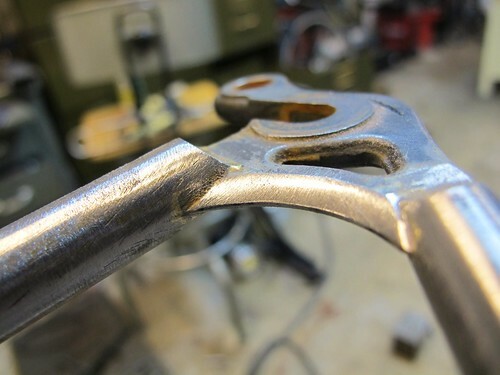 It is a bit of a signature, and allows me to give some of the lugged "classic" feel on bikes that are better served with other joinery methods. Because of the freedom in tube selection, the bilam serves as my default unless someone is specifically interested in a lugged or fillet bike. I have a couple on the plate now that combine several of these methods. Have admired your work for a while now. This was the article that caught my attention for some reason. I guess it seemed your answer was detailed and well thought out and straight forward. I just have to say that your blue bike at NAHBS was a stunner. I musta walked by that thing 10x and each time I'd catch something different. I wasn't the only one cuz everytime I walked by you were mobbed. I think I read somewhere that you liked to build bikes that could be used for fast rides as well for everyday, mundane tasks like commuting or grocery getting; that the owner didn't necessarily have to have a bike for each. Thus, your tag line, "For all the seasons of your cycling." I'm probably munging your words but I really liked that line of thought. Can you expand upon that (or correct me if my memory is faulty here)? Some would say that such a bike is just a bunch of compromises. What are your thoughts or rebuttals? Some extremely nice workmanship there. And I particularly like the head badge, as well as the scalloped seat stays.....yes, that seat stay is really nice. Great work. In fact its good looking metal work all around. 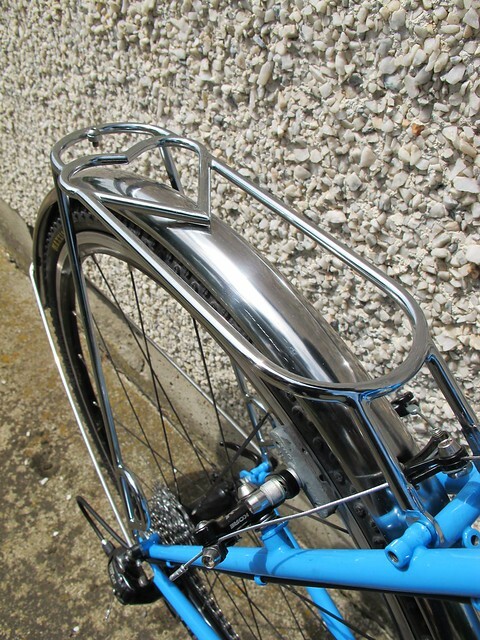 Some components look like they are chrome plated. 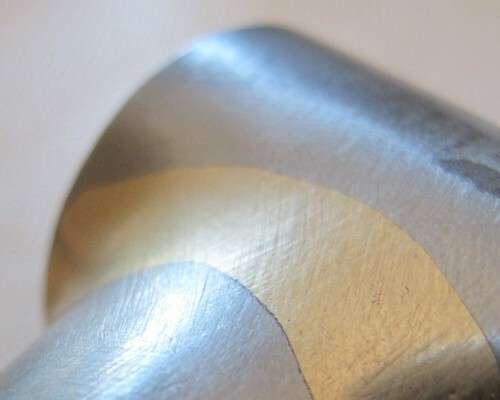 Is this the case of are they just highly polished stainless steel? And how about those tattoos on your arms, what's the story on these? Thanks! I'm glad to hear that people have read and enjoyed that article. I have written a few pieces for mags and their online outlets. Unlike conversation or the forums, one never really knows how they are received. Coming from the retail world (in Portland and Seattle, no less) I am fairly well versed in how people struggle to keep riding year round, and the steps people need to work through to be safe and comfortable. I myself was a bike commuter in New Hampshire and SLC- places not know for their friendly winters. To your question- I build bikes in all sorts of "categories", including straight up race bikes. One of the things I specialize in is matching the features of the bike to the rider and their real and intended use. Many of the bikes I build I would call "high performance non race bicycles". The specifics vary for their different owners, but these are often bikes that balance a bit of sport with real world, daily use functionality. This bike was built for someone with a 60mile round trip, year round commute. He wanted it to be as much like a race bike as it could be, but still fit customized fenders and a rear pannier rack. It has since become his go-to for endurance events as well. This bike was built for a women post surgery who could not ride her drop bar road bike, but didn't want to give up the feel. It is build from modern alloys and mimics the stage race behavior she wanted. With the XTR/ DA build kt it was less then half the weight of the cruiser she was riding at the time, and is stable enough to ride with fully loaded rear panniers. The term "all arounder" can sometimes get a bad rap. I definatley do NOT want to build swiss army knifes that have every feature on the off chance someone might think it looks cool. I work hard to boil down what it is a client needs, wants, and thinks they want functionally, and then use that information to design a bike that I feel meets those needs to the best of my ability. Sometimes compromises need to be made. I will not build a bike I am uncomfortable with, or one I think is a disservice to the client. That said, I do understand that I am meeting their needs. My job is to identify those compromises and work with the client to understand them and make sure they are made to the benefit of the rider and their bike. I like to tell clients that I'm the expert on what I do, but they are the expert on themselves. The design process is a conversation that helps us understand each other and helps insure that everyone gets what they are looking for. To step back a bit- I'm a big fan of bikes that get ridden. I really enjoy both sport and utility bicycles, and I am always excited to help someone merge the two in a way specific to their needs.
. . . this is absolutely inhuman, making us look at this stuff. I mean, I'm supposed to save my retirement fund for my retirement, for God's sake . . . Thank you! 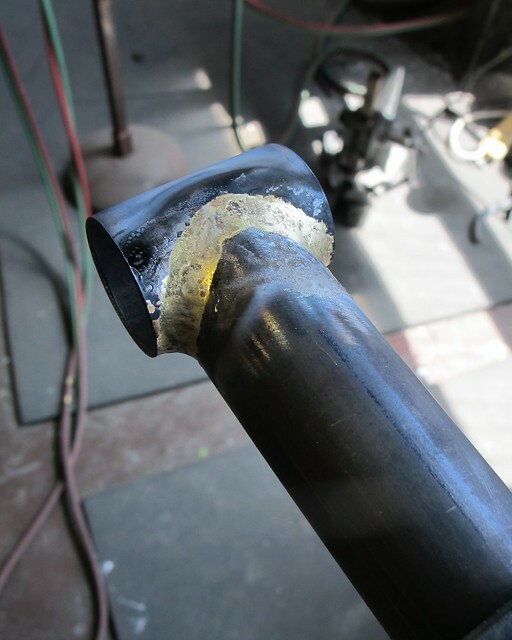 I do many "types" of seat stay attachment, with many variations within. At a recent event I brought 5 bikes, 4 with fastbacks, all with different treatments. I enjoy the details on the bikes in isolation, but I don't work on them that way. I try to balance all of the visual elements with each other to try to attain a certain level of design cohesion. And of course, all of these start first with a functional driver. On this cross bike, for example, I worked to echo the curves of the bridges with the curves in the laminate. 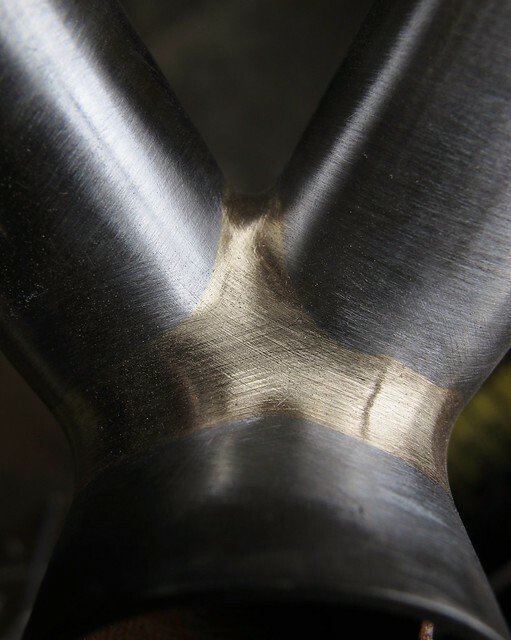 The sharp points were echoed in the handmade stem lug, the subtle fork tip pointing and the less subtle drop out edging. Of course, all of those details take a back seat to nailing the design and function of the bike for the rider. I love the metal working embellishments, but they are only relevant when the are on top of a great bike. None of them would make up for a bike that didn't do what it needed to. That leads me to chrome- in the last few years I have developed a pretty good relationship with the folks that do my chrome plating. For high wear items like stems and racks, it is my go-to finish. I offer roughly 5 triple plate options in addition to a few "non chrome" finishes (brass and nickle, for example). Not everyone likes the bright mirror finish, and I have several options of various "shine" to suit. Well done chrome is beautiful, very durable and a real positive for accessory parts. These guys do chrome well. I could go on and on, but I'll attempt to be brief. Feel free to skip this section. 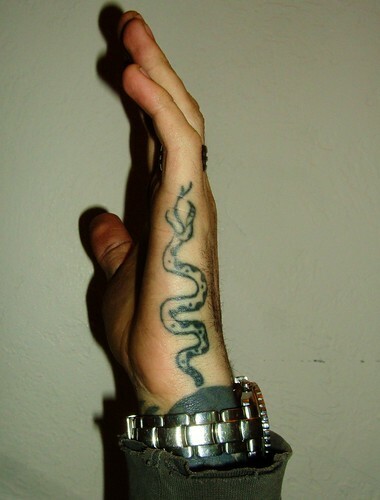 My tattoos are essentially "fusion" pieces- both thematically and visually (sort of like my bikes, eh?). They are my take on Japanese and Chinese imagery representing western themes and filtered through a Polynesian and traditional pacific rim "style". I try to be conscious of what I am appropriating and try to follow some influences while making something my own. Like the bikes they blend very specific details with larger gestural line. Thematically layered, they relate to my feelings about myself, my family, and my country. Punk patriot? I'm pretty heavily tattooed I guess, but I don't generally think about it much (I'm pretty used to me). I guess it makes me easy to pick out a bike shows though- so be sure to say hello! Last edited by EricEstlund; 09-24-2012 at 09:37 PM. Your bikes always have such nice clean fillets. 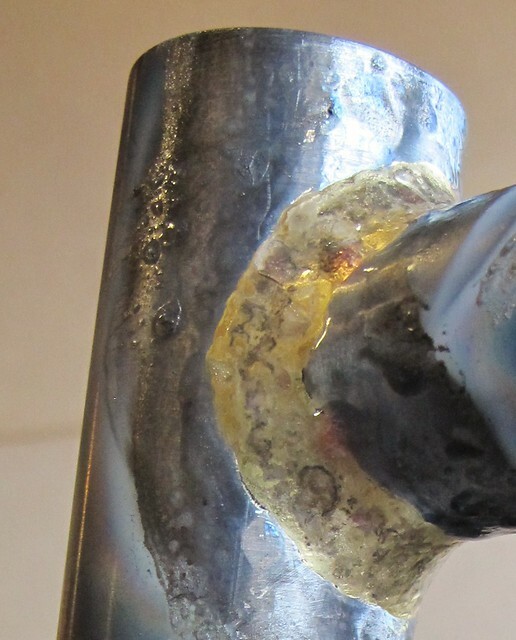 How much time does it take from prepping the tubes to getting the joint to this stage? Your head badge logo...Pear or Plum Blossom? It reminds me of Chinese cut-paper folk designs. I know you are a coffee guy: Beanery, Vero, or Hideaway? Last edited by William; 09-25-2012 at 07:29 AM. I think I lay down an arguably "clean" raw fillet (ie- consistent and smooth from the torch). 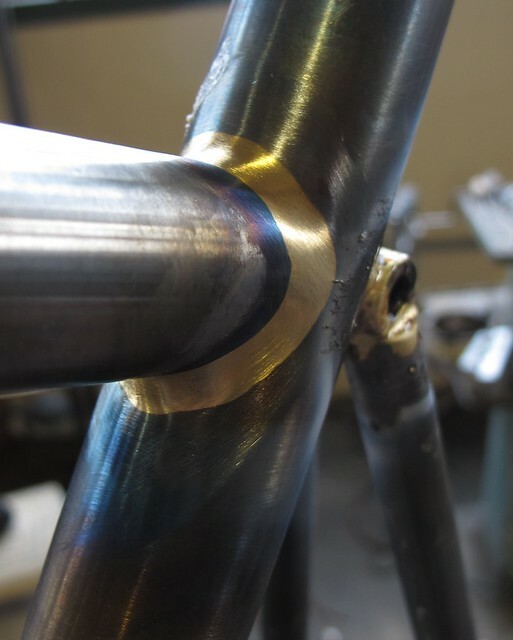 Fillet brazing is an example of conflicted emotions. I love to do finish work, and I try to make it as smooth and consistent as I can with an even width, constant radius and feathered edges. 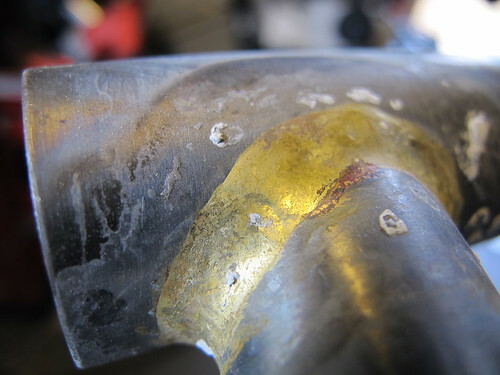 At the same time, it's a constant goal to refine the brazing to the point of "perfection". I recently told that to Jeff Lyon, a builder I greatly respect, and he just laughed at me. He said I was already there. I laughed back and said I still see improvements, they are just much more incremental then they used to be. In a sort of flip on Lemond's words; it never get's easier, you just go faster. Or in this case, about the same pace, but with better results. Regarding the headbadge- it's a stylized plum blossom. In classic art geek fashion, it's a nod to Chinese art history. The plum blossom (one of the three friend's of winter). It symbolizes perseverance, longevity and strength in adversity. Seemed like a good association for the business and the machines. For folks that like the raw process shots, I have several thousand over on flickr, easily sorted by project and subject. Last edited by EricEstlund; 09-25-2012 at 09:13 AM.